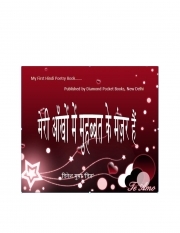 Description of "Meri Aankhon Men Muhabbat Ke Manzar Hain (eBook)"
This Book is Hindi Poetry Collection Contains Shayari, Poems, Songs & Articles on Following Topics. You can Downlode Free PDF version as sample copy of some of My best Poems from My Original Book. Complete Book is available as hard copy on Homeshop18 with Rs 75 & Free shipping. I am Software Engineer By Profession & Writing by Interest. You can see some of my creations on following links. लबों तक नहीं आता, जो मेरे दिल के अन्दर है ! Reviews of "Meri Aankhon Men Muhabbat Ke Manzar Hain (eBook)"
This is Dinesh Gupta,Writer of this Book "मेरी आँखों में मुहब्बत के मंज़र हैं"
This PDF contains some of good Poems from My Book, you can visit my FB Page for more Poems.You can downlode this PDF free.